Suffering from lower back pain? You’re not alone. In fact, low back pain is the leading cause of disability worldwide, according to the Global Burden of Disease 2010. Lumbar support cushions have been shown to be effective in both relieving and preventing acute and chronic low back pain. In this buyer’s guide, we’ll discuss the features and benefits of the different lumbar support cushions that are available and give you our suggestions for the best support cushions currently on the market. But first, let’s take a closer look at the common causes of lower back pain and discuss how a lower back support cushion can help. There are many conditions that can cause lower back pain, including nerve irritation, ruptured or herniated discs, osteoarthritis, spinal infections, and conditions of the bones and joints. The most common cause of lower back pain, however, is lumbar strain. Lumbar strain occurs as a result of injury or damage to the tendons and muscles of the lower back. The injury is usually caused by improper use or overuse of the muscles that help maintain a healthy curvature in the lower spine region. Lower back strain is characterized by discomfort and pain the lower back area. The pain can range from mild to severe, depending on the degree of damage to the muscles and tissues of the lower back. Lower back pain is classified as an acute condition if it lasts for only a few days. Back pain that persists for longer than three months is considered a chronic condition. Studies show that lumbar strain is most common in individuals over 40 years of age, but this type of injury can occur at any age. According to experts, more than 80 per cent of adults will experience low back pain at least once in their lifetime. How Can a Lumbar Support Cushion Help? Sitting in an office chair for extended periods of time can cause injury to the low back or exacerbate an existing injury. The reason for this is that sitting forces you to maintain a static position that places stress on the back muscles and spinal discs. Worse yet, many people fail to maintain a good posture while sitting and instead slouch forward or down in the seat. This further contributes to low back strain and the resulting discomfort. Two popular solutions for preventing lower back pain – particularly for those whose field of work involves sitting for prolonged periods are standing desks and ergonomic kneeling chairs. There is, however, a more convenient solution: lumbar support cushions. Lumbar support cushions fit against the natural S-curve to provide extra support for the lower back region when you’re sitting for long periods of times. This, in turn, helps properly align the neck, upper spine, and shoulders, providing instant relief from upper and lower back pain. Lumbar support cushions also help relax the muscles and tendons in the low back, further reducing pain and discomfort. Help align the back, neck, shoulders and hips properly to improve posture and relieve pain. Are generally safer than using medications to relieve lower back pain. May be covered under some health insurance plans. Are an inexpensive alternative to ergonomic chairs, standing desks, and expensive medical devices. There are four basic types of lumbar support cushions: adjustable, moulded foam, flexible, and air filled. Adjustable: These types of lumbar cushions feature straps that allow you to easily customize your level of support. They usually have a removable insert that prevents the cushion from conforming to the shape of the chair instead of conforming to the curve of your spine. Adjustable designs are a good option for those who plan to use the lumbar support cushion on different seats (i.e car seats, kitchen chairs). Moulded foam: Molded foam lumbar support pillows come in various shapes and sizes. They are filled with viscoelastic foam (memory foam), which conforms to the natural contours of your body. Flexible: These cushions feature a highly flexible design that follows the curvature of the spine, regardless of the type of seat the cushion is used on. Air-filled: These lumbar support cushions can be inflated using an included air pump to provide varying degrees of lower back support. Below are a few things to look for in a good lumbar support cushion. Lumbar cushions are covered with a variety of fabrics that provide varying degrees of comfort. A lumbar cushion covered with a velvety material is a good choice if your office is chilly. If your office is very warm, consider a lumbar cushion covered with cool mesh or synthetic fabric. Most lumbar support pillows on the market today are filled with memory foam, which conforms to the curve of the spine to provide customized support where you need it most. Another popular filling type for lumbar support pillows is natural buckwheat hull, which offers excellent support for the spine while soothing the tense muscles of the lower back. Other filling types, such as polyester and polyfill, may not provide the firmness and structure needed to maintain proper alignment of the spine and relieve lower back pain. If you spend a lot of time sitting at your desk or live in a warmer climate, you’ll want to ensure your lumbar support cushion is covered with a breathable material. You’ll also want to look for lumbar cushions made with a fabric that has moisture-wicking properties. 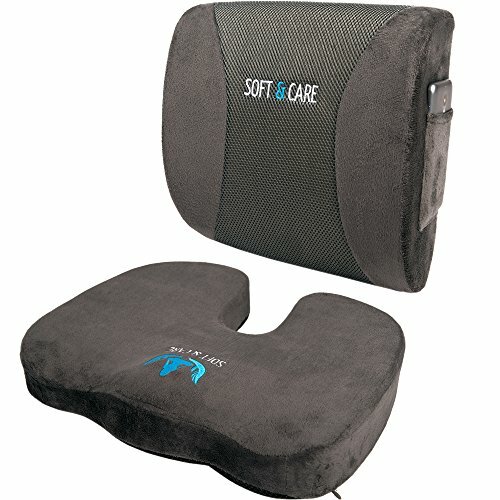 An adjustable lumbar support pillow saves you money in the long run, as it can be used on any type of seat. If you choose a design that isn’t adjustable, it’s a good idea to try the chair out on different types of chairs to ensure it provides a consistent level of support. Traditionally, lumbar support cushions featured a cylindrical shape. Newer lumbar support pillows come in a variety of shapes that are designed to provide better support for the lumbar region of the back. The most popular shapes for modern support pillows are wedge designs, which are characterized by their narrow top and wider bottom; half-moon shapes, which feature a D-shaped contour that relieves pressure in the lower spine, neck, and legs; and contoured designs, which are intended to support both the mid and lower back. The cushion should properly fit the dimensions of your back. In general, shorter people will require a thicker cushion, while taller people should consider a thin cushion design. Heavier individuals will want to look for designs that won’t compress or become deformed with repeated use. A lumbar cushion’s price is a good indicator of its quality. Cheaper cushions are generally made from lower quality materials and don’t provide as much support as more expensive versions. While this isn’t a hard rule, it’s a good idea to thoroughly research the cushion you intend to purchase to ensure it will provide adequate protection against lower back pain. In this section, we’ll review the best lumbar support cushions available on the market today. 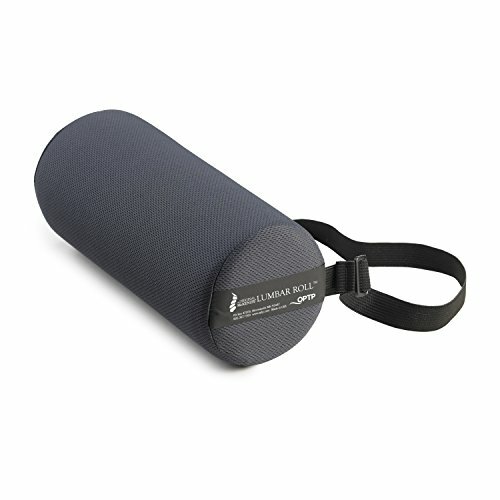 The original McKenzie Lumbar Roll features a cylindrical shape measuring 11 inches in length and 4.75 inches in diameter. It was designed by Robin McKenzie, a leading expert in spinal health and the founder of McKenzie Institute International. Priced at just over $20, the McKenzie roll is an excellent choice for those on a tight budget. The McKenzie Lumbar Roll features a foam construction and is offered in two densities: standard or firm. The roll is designed to conform to the inward curve of the lower back, keeping your spine properly aligned. It has a single strap that can either be secured around your waist or around your office chair. The removable and washable cover is made from a comfortable moisture-wicking fabric that draws perspiration away from the lower back to help keep you cool. This lumbar support cushion does not come with a warranty, which may be a concern to some. that said, its low price point and consistently high ratings from users make the McKenzie Lumbar Roll tough to beat. If you’re looking for an inexpensive, durable, and portable product that offers superior ergonomic performance, this may be the right lumbar pillow for you. The SOFTaCARE Seat Cushion is actually made up of two pieces: a lumbar back support and an orthopaedic seat cushion. It is designed to relieve lower back pain as well as pain from herniated discs, sciatica, and tailbone injuries. It is constructed from 100 per cent pure premium memory foam, which offers comfortable support while resisting compression. The seat cushion component features an anatomical shape, which helps reduce pressure on the coccyx. The lumbar support component has two adjustable straps and can be used on almost all types of seats, including office, car and aeroplane seats. The cushion has a breathable, removable cover made from a soft velour that feels great against the back. There is a pocket for keeping phone or music player handy. Some reviewers have complained that the SOFTaCARE Seat Cushion isn’t firm enough, though, so you’ll want to be sure to test it out before buying it. 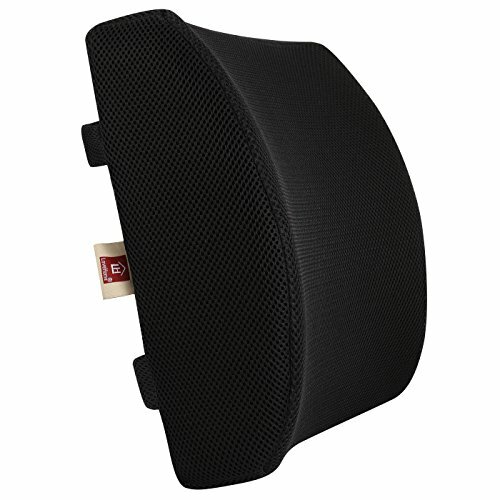 The LoveHome Memory Foam Lumbar Support Cushion features a memory foam construction that allows the cushion to conform to the curve of your spine. It is thicker than many other lumbar cushions on the market, making it an excellent choice for those who sit in deep chairs for long periods of time. A single strap along the back of the cushion allows the cushion to be securely fitted onto different chairs and seats, while a removable, breathable cover adds to the product’s ease of maintenance. What makes this lumbar support pillow especially comfortable is its moisture-wicking mesh cover, which draws moisture away from the skin and prevents the accumulation of sweat – a common complaint with these types of cushions. The mesh cover also has antimicrobial properties, which help inhibit the growth of odour-causing bacteria. The LoveHome Memory foam Lumbar Support Cushion only comes with a 60-day warranty, but its low price and highly-rated customer reviews help make this lumbar support pillow worth a look. The Vertteo Full Lumbar Support is designed to provide full orthopaedic support by maintaining proper alignment of the lower as well as the upper thoracic region of the spine. This support pillow is frequently recommended by chiropractors due to the superior protection it offers against lower back strain. Filled with 100 per cent pure memory foam, this pillow provides a snug, comfortable fit that won’t compress over time. This lumbar support cushion features a wide, high-back design with a large contour that fits snugly against the natural curves of the spine. It has a long, adjustable strap to help keep it in place and a hypoallergenic cover that is removable and washable. The exterior fabric is made of hypoallergenic faux fur, which adds to the cushion’s comfort. The Vertteo Full Lumbar Support fits all kinds of chairs and seats, making it an excellent choice for those seeking the utmost in portability. It can be easily transferred from an office chair to a car seat, a kitchen or dining room chair, a rocking chair, or even an aeroplane seat. A minor flaw with this product is its single strap, which prevents the cushion from staying in place as you move around in your seat. Overall, though, this cushion provides excellent support for the entire back. 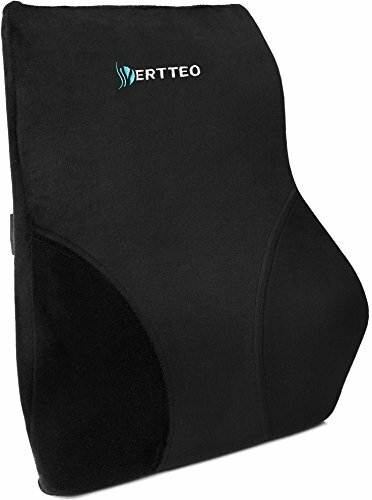 The Vertteo Lumbar Support backed by a 1-year free replacement warranty. The Go Lumbar Support Mesh Back Cushion is a versatile chair support featuring an adjustable, breathable mesh design. It can be used on most types of chairs and car seats and has an adjustable strap for ensuring the most comfortable fit. The mesh conforms to the shape of your spine to provide extra support and relieve muscle pressure. What we love about this cushion is its lightweight design, which makes it easy to transfer from an office chair to a kitchen chair, or a car seat. We also love its ease of maintenance. There is no cover that has to be removed and washed; the breathable mesh design keeps you cool while preventing perspiration from accumulating in the lower back area. That said, this product isn’t without its flaws. Some users have complained that this cushion tends to slip down on the chair back. 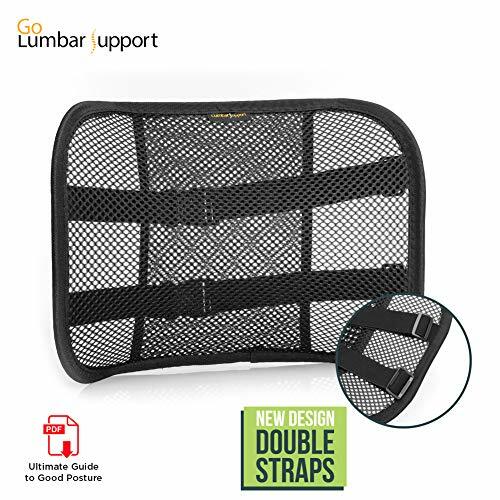 Still, the Go Lumbar Support Mesh Back Cushion provides excellent value for its low price and is worth considering by anyone needing mild to moderate lower back support. In terms of affordability, comfort, and support provided, the Vertteo Full Lumbar support has it all. Add portability to the mix and you have the ideal cushion to support you at the office, while driving, on a long flight, or in any other situation that requires prolonged periods of sitting. Its attractive design allows the Vertteo full Lumbar Support Cushion to fit in well with any home or office decor, while its exceptional construction ensures the cushion feels as great as it looks. Lumbar support cushions are a great alternative to ergonomic chairs and standing desks for individuals who want to prevent, or are already experiencing lower back pain. Some people also find that wearing a back brace can help support their lower back whilst they are not using a lumbar chair support. See this post on the best back braces for more information. Another great way to help lower back pain is to accommodate stretching into your daily routine to relieve tightness in the lower back. For more information see our post on the best stretches for lower back pain. This comprehensive buyers guide should help you understand the different cushion types and features that are available so you can choose the best lumbar support for your needs.